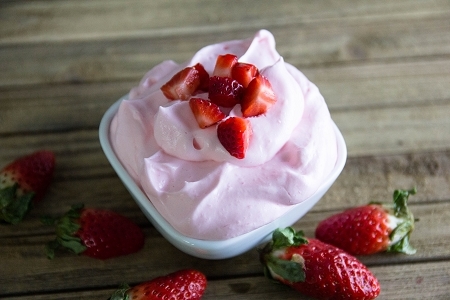 Our reduced-calorie Strawberry Mousse mixes make fluffy pink desserts bursting with the flavor of refreshing strawberries. No cooking required—just add milk, whip and chill. Makes easy and delicious pies, tarts and parfaits. Maltodextrin, Whipping Base (Partially Hydrogenated Coconut Oil &/or Palm Kernel Oil, Corn Syrup Solids, Sodium Caseinate (a Milk derivative), Proplylene Glycol Monoesters, Lactic Acid Esters & Sodium Aluminate), Nonfat Dry Milk, Corn Starch, Carrageenan Gum, Tetrasodium Pyrophosphate, Modified Starch, Adipic Acid, Modified Cellulose, Strawberry Flavor, Vanilla Flavor, Sucralose, Acesulfame Potassium, FD&C Red #40.